Athletics: Tony La Russa (mgr. ), Dennis Eckersley. The 1988 World Series matched the Oakland Athletics against the Los Angeles Dodgers, with the Dodgers upsetting the heavily favored A's to win the Series in five games (the exact opposite result of their 1974 meeting, which also went five games). The most memorable moment of the 1988 World Series occurred when injured Dodgers MVP Kirk Gibson, who could barely walk due to injuries suffered during the National League Championship Series, hit a pinch-hit, walk-off home run against Athletics closer Dennis Eckersley in Game 1. Although Gibson's walk-off has become an icon of baseball, Orel Hershiser was the heart and soul of the team. Hershiser dominated baseball at the end of the 1988 season, setting the all time scoreless inning streak at 59 innings, recording five straight shutouts, leading the league with 23 wins and 267 innings, and winning the Cy Young and Gold Glove awards. He was the MVP of the NLCS, starting three games, getting the save for Game 4, and shutting out the Mets in Game 7. In the World Series, he shut out the heavily favored A's in Game 2, and pitched a two-run, complete game in the decisive Game 5 victory. The Los Angeles Dodgers won the National League West division by seven games over the Cincinnati Reds then upset the New York Mets, four games to three, in the 1988 NLCS. The Oakland Athletics won the American League West division by thirteen games over the Minnesota Twins then swept the Boston Red Sox, four games to none, in the American League Championship Series. This was the first World Series to have the series logo on the players' uniforms of both teams (the previous year, only the Cardinals wore it). The Dodgers' team batting did not finish in the top five in any offensive statistical category except batting average (fifth), at .248—no regular or backup hit over .300 or drove in over 90 runs. Kirk Gibson’s 25 home runs led the team but was only good enough for seventh in the National League. Slugger Pedro Guerrero had a sub-par year and was traded in July to the Cardinals for pitcher John Tudor. Kirk Gibson was the only position player named to the All-Star Game, but declined the invitation. Hershiser was backed-up by a pair of “Tims,” Tim Leary (17–11, 2.91) and rookie Tim Belcher (12–6, 2.91), and the July acquisition of John Tudor further strengthened the staff. The bullpen was outstanding, headed by Jay Howell (21 saves, 2.08), Alejandro Peña (12 saves, 1.91), and longtime New York Mets closer Jesse Orosco. The Dodger bullpen led the league in saves with 49. It was intensity and fortitude, however, that defined the 1988 Dodgers, a trend that began when Kirk Gibson was signed as a free-agent over the winter from the Detroit Tigers, the team he helped lead to the 1984 World Championship. Moreover, the invincible Hershiser threw shutouts in his last six regular season starts en route to a record 59 consecutive scoreless innings pitched, breaking the mark held by former Dodger great Don Drysdale. Hershiser would dominate the Mets in the NLCS, while Gibson hobbled through on bad knees and a bruised hamstring but would produce a memorable, if not the greatest, at-bat (in Game 1) of the World Series. The powerful Oakland Athletics had all the confidence and swagger of a heavily favored team. The “Bash Brothers” duo of Mark McGwire (32 home runs, 99 RBI, .260 batting average) and José Canseco (42 home runs, 124 RBI, .307 batting average) were in their early twenties, emerging as young superstars. Canseco became the first player to hit 40 or more home runs and steal 40 or more bases in Major League history and would capture the Most Valuable Player award in the American League. Veterans Dave Henderson (24 home runs, 94 RBI, .304 batting average) and longtime Pirate Dave Parker (12 home runs, 55 RBI, .257 batting average), also contributed with both their bats and their experience. The 1988 World Series marked Don Baylor's third consecutive World Series with three separate teams. Besides being a member of the 1988 Athletics, Baylor was also a member of the 1986 Boston Red Sox and 1987 Minnesota Twins. But anything can happen in a short series, as proven by these 1988 Los Angeles Dodgers, who out-hit (41–28, .246–.177), out-muscled (5 HRs–2 HRs), and out-pitched (2.03–3.92) the seemingly unbeatable Oakland Athletics, incredibly winning the Series in five games, outscoring the A’s, 21–11, bringing Tommy Lasorda and the Dodgers their sixth World Series Championship. Because of using ace Orel Hershiser in Game 7 of the NLCS, the Dodgers had to open with rookie Tim Belcher in Game 1. Meanwhile, Oakland sent a well-rested Dave Stewart to the mound. Both pitchers, however, would have their troubles in this game starting out. Belcher loaded the bases in the first by giving up a single to Dave Henderson, then hitting José Canseco and walking Mark McGwire. Canseco was hit in the right bicep as he checked his swing and home plate umpire Doug Harvey awarded him first base. Dodger manager Tommy Lasorda disputed this, thinking the ball hit Canseco's bat. Audio from the game seemed to confirm this, but replays showed the ball hit Canseco in the bicep. Stewart's problems began in the bottom of the first when he purposely hit Steve Sax with his first pitch. After retiring Franklin Stubbs, Stewart balked Sax to second. Mickey Hatcher, who hit only one homer all season, then shocked the crowd by hitting a two-run shot off Stewart. Hatcher further excited the Dodger stadium fans by running full speed around the bases, prompting Vin Scully to comment, "He's a Saturday Evening Post character!" Commentator Joe Garagiola noted, "He ran in like they thought they were going to take it off the scoreboard! He really circled those bases in a hurry!" In the sixth, the Dodgers broke Stewart's groove with three consecutive one-out singles, the third one by Mike Scioscia that scored Mike Marshall. The A's lead was cut to 4–3. A's closer Dennis Eckersley came on to pitch the ninth to close it out for Stewart. After retiring the first two batters (Mike Scioscia and Jeff Hamilton), Eckersley's former A's teammate Mike Davis, batting for Alfredo Griffin, walked on five pitches. During Davis' at-bat, Dave Anderson initially entered the on-deck circle to hit for Alejandro Peña. After Davis walked, Lasorda called back Anderson and sent up a hobbled Kirk Gibson to the plate, amidst cheers from the Dodger Stadium crowd. Gibson bravely fouled off Eckersley's best offerings, demonstrating how badly he was hurting. On one foul, Gibson hobbled towards first and prompted Scully to quip, "And it had to be an effort to run THAT far." After Gibson fouled off several pitches, Davis stole second on ball three. On the next pitch, Gibson, remembering a scouting report that said Eckersley liked to throw a backdoor slider to left handed hitters on 3–2 counts, slammed that backdoor slider into the right field bleachers to win the game. The footage of Gibson hobbling around the bases on both hurt legs and pumping his fist as he rounded second became an iconic baseball film highlight. With a rested Orel Hershiser on the mound, the Dodgers took a 2–0 Series lead. Hershiser got all the runs he needed in the third, with Mike Marshall providing the big blow with a three-run homer. Hershiser went the distance, allowing only three singles, all three hit by Dave Parker. Hershiser also contributed offensively, with three hits, including an RBI double in the fourth inning. In the five-run third inning, he singled, went to third on an opposite-field single by Steve Sax and later scored. He was the first pitcher to get three hits in a World Series game since 1924. The A's got back in the series on the strength of strong pitching by former Dodger World Series hero Bob Welch and three relievers. Dodger starter John Tudor left during the second inning with tightness in his pitching shoulder. A's relievers helped squelch a Dodger threat in the sixth. Danny Heep led off with a double. John Shelby singled to left, but Heep was held up at third on the throw home as Shelby took second. Welch walked Mike Davis to load the bases, and left-hander Greg Cadaret was brought in to face lefty-hitting Mike Scioscia. Scioscia popped out to third. A's manager Tony LaRussa then brought in right-hander Gene Nelson to face Hamilton, who forced Heep out at home. Alfredo Griffin grounded out to end the threat. The A's got their winning run in the bottom of the ninth when Mark McGwire deposited a one-out fastball from Jay Howell into the left-center field seats. Jay Howell was suspended for two games (shortened from three) by then National League president Bart Giamatti, for using pine tar during the 1988 National League Championship Series against the New York Mets. Howell was, incidentally, also the losing pitcher in the prior year's All-Star Game in Oakland while a member of the Oakland Athletics. The Dodger pitching tamed Oakland monsters José Canseco (one hit, his grand slam in Game 1) and Mark McGwire (one hit and one RBI, which came in Game 3) for pretty much the entire series. 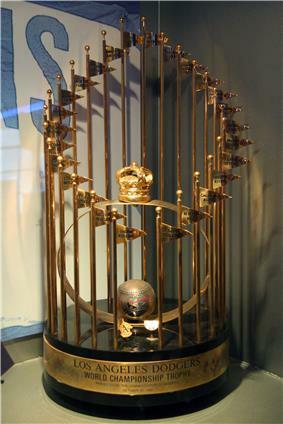 The 1988 World Series marked the last time that NBC would televise a World Series for seven years. Beginning in 1990, NBC would be shut out of Major League Baseball coverage completely, after CBS signed a four year, exclusive television contract. After splitting coverage of the 1995 World Series with ABC, NBC would next cover a World Series exclusively in 1997. This was the last 1984 Summer Olympic Games in Los Angeles. Gibson...swings, and a fly ball to deep right field! This is gonna be a home run! Unbelievable! A home run for Gibson! And the Dodgers have won the game, five to four; I don't believe...what I just saw! I don't believe what I just saw! — Jack Buck on CBS Radio with the call of Kirk Gibson's walk-off home run to end Game 1. High fly ball into right field! She i-i-i-i-is gone! (long pause where only crowd noise can be heard) In a year that has been so improbable, the impossible has happened! — Vin Scully on NBC calling the same home run. Here's the pitch, and a drive hit to right field, way back, this ball is gone! — Dodger radio announcer Don Drysdale on KABC calling the same home run. — Tommy Lasorda in the Dodgers clubhouse to his team after Game 5. ^ "1988 World Series Game 1 - Oakland Athletics vs. Los Angeles Dodgers". Retrosheet. Retrieved September 13, 2009. ^ "1988 World Series Game 2 - Oakland Athletics vs. Los Angeles Dodgers". Retrosheet. Retrieved September 13, 2009. ^ "1988 World Series Game 3 - Los Angeles Dodgers vs. Oakland Athletics". Retrosheet. Retrieved September 13, 2009. ^ "1988 World Series Game 4 - Los Angeles Dodgers vs. Oakland Athletics". Retrosheet. Retrieved September 13, 2009. ^ "1988 World Series Game 5 - Los Angeles Dodgers vs. Oakland Athletics". Retrosheet. Retrieved September 13, 2009. ^ Miller, Stuart (March 1991). "Memories of Eight Great Moments in Baseball History". Baseball Digest (Lakeside Publishing Co.) 50 (3): 75. Forman, Sean L. "1988 World Series". Baseball-Reference.com - Major League Statistics and Information. Archived from the original on November 30, 2007. Retrieved December 9, 2007.